This article is about the mathematical concept. For other uses, see Power of 10 (disambiguation). 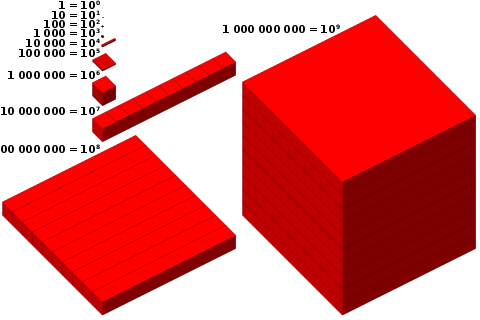 Visualisation of powers of 10 from one to 1 billion. In decimal notation the nth power of ten is written as '1' followed by n zeroes. It can also be written as 10n or as 1En in E notation. See order of magnitude and orders of magnitude (numbers) for named powers of ten. There are two conventions for naming positive powers of ten, called the long and short scales. Where a power of ten has different names in the two conventions, the long scale name is shown in brackets. The sequence of powers of ten can also be extended to negative powers. The number googol is 10100. The term was coined by 9-year-old Milton Sirotta, nephew of American mathematician Edward Kasner, popularized in his 1940 book Mathematics and the Imagination, it was used to compare and illustrate very large numbers. Googolplex, a much larger power of ten (10 to the googol power, or 1010100), was also introduced in that book. Scientific notation is a way of writing numbers of very large and very small sizes compactly when precision is less important. A number written in scientific notation has a significand (sometime called a mantissa) multiplied by a power of ten. This is generally used to denote powers of 10. Where n is positive, this indicates the number zeros after the number, and where the n is negative, this indicates the number of decimal places before the number. The notation of mEn, known as E notation, is used in computer programming, spreadsheets and databases, but is not used in scientific papers. Powers of Ten (1977). Nine-minute film. US Public Broadcasting Service (PBS), made by Charles and Ray Eames. "An adventure in magnitudes. Starting at a picnic by the lakeside in Chicago, this film transports the viewer to the outer edges of the universe. Every ten seconds we view the starting point from ten times farther out until our own galaxy is visible only as a speck of light among many others. Returning to Earth with breathtaking speed, we move inward - into the hand of the sleeping picnicker - with ten times more magnification every ten seconds. Our journey ends inside a proton of a carbon atom within a DNA molecule in a white blood cell."